Home » VectorVest » Keep buying Volex #VLX says VectorVest. The current year growth strategy is already well underway. Keep buying Volex #VLX says VectorVest. The current year growth strategy is already well underway. By Alan Green in VectorVest on 1st May 2018 . On January 19th2018, VLX moved from main market to AIM, in order to give it greater flexibility to pursue growth and partnership opportunities. On April 11th2018, VLX published a trading statement ahead of FY results on June 8th2018, and confirmed that it was trading in line with expectations. VLX said that FY sales expected to show a modest return to growth (c+5%) reversing the trend of a sales decline seen over the previous 3 years. The group reported net cash at the year-end of $9.9m, up from $5.8m reported at the half year. Exec Chairman Nat Rothschild said the sales pipeline, developed over the past year, “has started to convert into new revenues for the group, and we expect to deliver a robust trading performance for the full year in line with the Board’s expectations.” He added that VLX “continue to review value accretive acquisitions in order to diversify our customer base, and expect to make further progress in this regard in the coming months.”Separately on April 27th2018, VLX announced it had completed the acquisition of MC Electronics LLC, a US based manufacturer of customised complex medical and industrial cables. In a previous note on VLX published Oct 24th2017, shares rose from the then 73p to 86p before falling back. Following the AIM move in January, shares traded at 64p, at which point the VectorVest VLX stock graph analysis logged another rise in the GRT (Earnings Growth Rate). Shares have risen in value since then, but the GRT rating today still logs an excellent 34%. 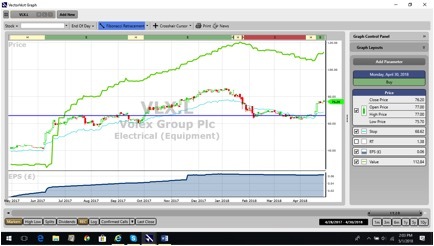 Despite the RS (Relative Safety) rating as ‘fair’, scoring 0.94 on a scale of 0.00 to 2.00, VLX scores highly on the VST-Vector, the master indicator for ranking every stock in the VectorVest database, logging a ‘very good’ rating of 1.30 on a scale of 0.00 to 2.00. With a VectorVest stock valuation rating of 112p, VLX still remains considerably undervalued at the current 76p. The chart of VLX.L is shown above in my normal format. The blue line study in the window below the price plot shows that earnings per share (EPS) has more than trebled over the past year. This is the engine that’s driving the share price. Since January 2018 the share has pulled back to a previous resistance level and charted a “double bottom” at this level which is a positive sign. Over the past month the share has traded higher and is presently on a BUY recommendation on VectorVest with a stop loss of 68p. I have spoken about VLX on numerous occasions in the past, highlighting a well-managed company with a broad and diverse manufacturing base. The return to growth is highly significant, and with the move to AIM improving flexibility (and saving money), the current year growth strategy is well underway already with the acquisition of MC Electronics. Fuelled with a growing cash pile for further acquisitions, VectorVest sees every reason to keep buying the shares. Readers can examine trading opportunities on XPD and a host of other similar stocks for a single payment of £5.95. This gives access to the VectorVest Risk Free 30-day trial, where members enjoy unlimited access to VectorVest UK & U.S., plus VectorVest University for on-demand strategies and training. Link here to view.